--- Economical pads provide an excellent place to record anything you find noteworthy. Easy-tear Letr-Trim® perforations ensure that individual sheets separate neatly. Sturdy chipboard backing provides a good writing surface. This product was made from wood that came from a certified managed forest. 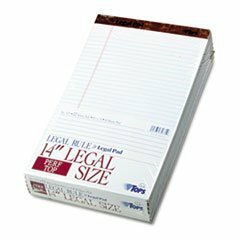 Pad Type: Ruled; Sheet Size: 8 1/2" x 14"; Ruling: Legal.